Are you tired of that vertical ladder that becomes more difficult to climb each year? You're not alone. That's the beauty of the angled dock stair design. There are several manufacturers out there who really offer the best angled dock ladders. Wet Steps - Available as the 5 Step Wet Steps, 6 Step Wet Steps and 7 Step Wets Steps ladders. Made from marine grade aluminum, not only the construction quality but the design alone really sets it apart... nice wide steps, handrails for added assistance, flip up - ladder rotates 180 degrees and rests safely on your dock, 500 lb capacity, and a relaxed 55 degree climb angle. Aqua-Stairs - This is another heavy-duty angled dock stair that really stands out. It doesn't have the handrails but it's another comfortable ladder to climb up and down. Built from marine grade aluminum. This ladder also flips up 180 degrees out of the water and rests on top of your dock. Heavy duty 500 lb. capacity. It has an easy 58 degree climb angle and with its 8” deep steps, it provides an industry leading step plate compared to other manufacturers. And, its step treads are welded in and not bolted on! JIF Marine - This is your economical option for getting a more comfortable angled style ladder without the higher price of the Wet Steps or Aqua Stairs. JIF Marine builds a great ladder for the money. Built from a marine grade anodized aluminum choose from the 3 step, 4 step, 5 step and 7 step models. Lighter duty 300 lb. weight capacity. 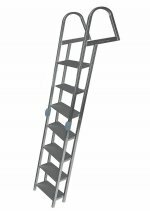 Wet Steps 5 Step Aluminum Dock Ladders with Standard Aluminum Finish, 55 Degree Climb Angle, 500 lb. Weight Capacity, Marine Grade Aluminum. Wet Steps 6 Step Aluminum Dock Ladders with Standard Aluminum Finish, 55 Degree Climb Angle, 500 lb. Weight Capacity, Marine Grade Aluminum. 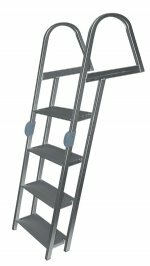 Wet Steps 7 Step Aluminum Dock Ladders with Standard Aluminum Finish, 55 Degree Climb Angle, 500 lb. Weight Capacity, Marine Grade Aluminum. 36" Tall Dock Safety Handrail- Inverted U-Shape. 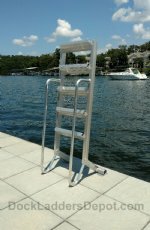 Aqua-Stairs 3 Step Angled Aluminum Dock Ladder, Wide 8" Step, 58° Climb Angle, 500 lb. Weight Capacity. Aqua-Stairs 4 Step Angled Aluminum Dock Ladder, Wide 8" Step, 58° Climb Angle, 500 lb. Weight Capacity. Aqua-Stairs 5 Step Angled Aluminum Dock Ladder, Wide 8" Step, 58° Climb Angle, 500 lb. Weight Capacity. Aqua-Stairs 6 Step Angled Aluminum Dock Ladder, Wide 8" Step, 58° Climb Angle, 500 lb. Weight Capacity. Aqua-Stairs 7 Step Angled Aluminum Dock Ladder, Wide 8" Step, 58° Climb Angle, 500 lb. Weight Capacity. JIF Marine 3 Step Angled Anodized Aluminum Dock Ladder, Wide 5.25" Steps, 16° Climb Angle, 300 lb. Weight Capacity. FREE SHIPPING! JIF Marine 4 Step Angled Anodized Aluminum Dock Ladder, Wide 5.25" Steps, 16° Climb Angle, 300 lb. Weight Capacity. FREE SHIPPING! JIF Marine 5 Step Angled Anodized Aluminum Dock Ladder, Wide 5.25" Steps, 16° Climb Angle, 300 lb. Weight Capacity. FREE SHIPPING! JIF Marine 7 Step Angled Anodized Aluminum Dock Ladder, Wide 5.25" Steps, 16° Climb Angle, 300 lb. Weight Capacity. JIF Marine Footman Loops Dock Ladder Attachment Kit.